You've seen 'em: Minimalist shoes with five toes, four toes, or just one big toe box. People are donning these barefoot-style sneaks to run, walk, strength train—heck, to schlep to the grocery store. Even teens are getting in on the craze: My daughter's babysitter reports they're spreading through her high school like a cell phone wave at a Coldplay concert. But just because something's popular doesn't necessarily make it wise (towering stilettos, anyone?). Sure, if you're anything like me, you spent the better part of your childhood summers sans shoes, but now that we're adults with grown-up feet, is trying to mimic that experience such a good idea? Stephen M. Pribut, DPM, a fellow at (and past president of) the American Academy of Podiatric Sports Medicine who's been practicing podiatry for 34 years. Turns out it's not a bad idea—for some folks, anyway. "The human body has evolved to fit our function," Halbower-Fenton points out. "So biomechanically, we're best off duplicating as closely as possible what nature has designed." Adds Olson, "Barefoot-style shoes may help strengthen your feet and lower leg muscles, too, because they don't have all of the layers of cushioning you find in most fitness and running shoes." But that doesn't mean you should just toss your super-supportive, cushiony kicks and start wearing your minimalist pair 24/7. After all, your feet need time to get used to taking the brunt of all that pounding. Make the switch gradually, Pribut says. "First, start walking in the shoes, then add in small amounts of running," he advises. "Take a few months to do this as you gradually integrate them into your running routine." Same goes for walking, strength training, tai chi, whatever you're using them for—go slowly. Do heel drops and toe-pointing shin stretches to stave off shin splints (a common complaint among minimalist newbies), Halbower-Fenton advises. "Calf and arch exercises are also a good idea," Olson suggests. Take shorter strides to avoid injuries, Pribut says. "And I recommend a mid-foot landing for distance runners and a forefoot landing for sprinters." But beware: "If you have joint problems or need orthotics for other foot ailments, you're probably not a good candidate for these shoes," Olson points out. That last bullet? She's talking about me. But while my achy knees won't let me even think of using barely there shoes for runs or power walks, I love wearing them for strength-training sessions, short walks around the block, or even just working in the yard. I relish that "my feet are free!" feeling I remember from childhood—minus the stubbed toes and debris-induced scrapes. If you think you're ready to bare down (if you will), try one of these two pairs from Vibram Five Fingers. Both feel like protective second skins, and, thanks mostly to the independent toes, are the closest I've found to actually feeling like you're going barefoot. One caveat: Buy from an actual store (vs. online) if you can, since sizing can be tricky. 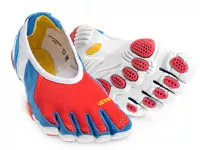 For running or fitness walking, try the Bikila LS ($100), winner of Health's 2011 Gear Awards for Best Barefoot Running Shoe. For strength training, tai chi, Pilates, kettlebells, yard work—you get the picture—try the Jaya ($85; shown above). What it all comes down to, of course, are these words of wisdom from Pribut: "Do what works best for you." So go ahead, give barefoot-style a try—just don't toss your regular sneaks yet.